Alcohol delivery Richmond :: Bentley's Mobile Bar delivers a prestigious alcohol delivery service to clients in Richmond TW9 and throughout Middlesex. All your alcohol, food and soft drinks needs are delivered directly to your home, 7 days a week. Bringing a level of service second to none, exclusively Bentley style! 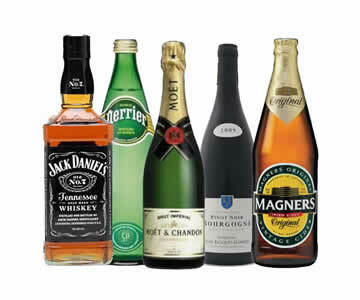 Whether it be a chilled bottle of champagne, a crate of beer or cider, spirits, wine or something from our ever growing stock of extras including mixers, snacks and much, much more, Bentleys Mobile Bar is your number one choice for alcohol, snacks and soft drinks delivery to Richmond TW9 and throughout Middlesex! Alcohol delivery Richmond TW9 :: we charge a flat delivery fee of £5.00 no matter where you are located or how much you order. Minimum £25.00 order. We are here to deliver alcohol, snacks and soft drinks directly to you in Richmond ... let us do the driving and you the social drinking ! Our Richmond alcohol delivery service will be your 4th emergency service and will prove to be the most important call you make all night, bringing life to your party, gathering or get together. Once you've placed your order, our professional, customer friendly staff we will have your order delivered within the hour and are willing to bend over backwards until you are satisfied. As seen on TV, we are a fast growing alcohol delivery service that brings convenience to a whole new level ... it's quick and easy.